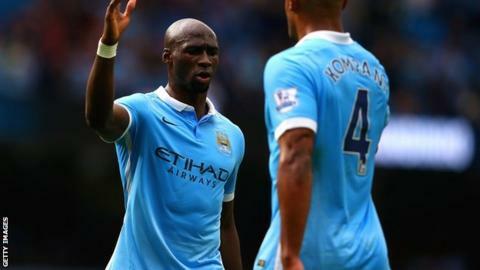 Manchester City's £32m purchase of Eliaquim Mangala from Porto in 2014 involved third-party ownership. Fifa has banned a club in Belgium's second division from signing players for two years and fined it 150,000 Swiss francs (£100,000) after it agreed to third-party ownership deals. TPO has been banned worldwide since May to try and stop players being forced to move clubs solely for profit-taking. Malta-based fund Doyen reportedly added 300,000 euros (£218,613) to Seraing United's budget for players' rights. They failed in their challenge to Fifa's ban in a Belgian court in July. They argued the ban broke European Union competition laws. But a Fifa committee said Seraing "sold part of the economic rights of several players to a third party". Uefa president Michel Platini has previously likened third-party ownership to "slavery". Manchester City had to buy out the contract rights from parties retaining a financial interest in Eliaquim Mangala when the defender moved to the Etihad from Porto for £32m in 2014. TPO has been banned in Britain since the start of the 2008-09 season when it was discovered that Argentine players Carlos Tevez and Javier Mascherano were owned by two offshore companies when they joined West Ham in 2006.